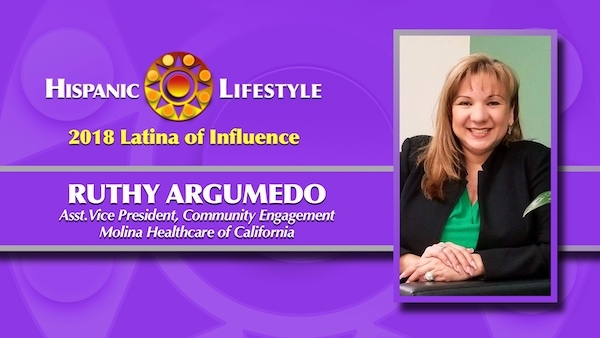 Hispanic Lifestyle is pleased to recognize Health Care Executive and Community Leader Ruthy Argumedo as a 2018 Latina of Influence. Ms. Argumedo along with our entire list of 2018 Latinas of Influence are invited to participate in Hispanic Lifestyle’s 2018 Latina Conference taking place April 4 and 5, 2018 in Ontario, California. My life has been marked by a joy in serving others and by experiencing success through united effort. I was born in Glendale, California, a child of immigrant parents. My upbringing was modest, but from a very early age, it was instilled in me to serve others. In my teens, I would accompany my father to pick up day-old bread and distribute it to underprivileged families. As a high school student, I started working at a medical group and quickly discovered a passion to help patients young and old to navigate their healthcare and learn how to access services. I received a paralegal degree from Pasadena City College then moved to Washington, D.C. to work for an international disaster and relief agency, ADRA International. During my time there, I was given the opportunity to learn of the great needs of many other countries and to participate in worldwide relief projects. One particularly satisfying experience was when I had the opportunity to coordinate and successfully organize a two-week, habitat educational event drawing 250,000 visitors to the Mall in Washington D.C. and educating thousands on the needs of underserved communities here in the states and around the world. Once again, this opportunity presented me with the realization that my passion and talent was to work with people in desperate need of basic services on multiple levels and to assist those who experienced barriers in obtaining health or community services. Returning to California, I was able to return to another one of my passions, which is healthcare. I worked with a large medical group with over 150 physicians serving San Bernardino, Riverside and Los Angeles Counties, educating and promoting health programs. When I started in the healthcare business, I had no idea that I would find a company whose employees so well matched my own passion for serving others. But I did. I am currently the Associate Vice President of Community Engagement for that company, Molina Healthcare. In this role, I work closely with several communities and local faith-based and community-based organizations to identify community needs. My work is focused on identifying grass root needs and serving underserved individuals and families. I joined Molina Healthcare in 2007 and quickly focused on the needs of the community. I created the Care 4 a Healthy IE, now one of the largest comprehensive health care events in the Inland Empire, serving over 20,000 individuals over the last six years. The events provide free medical, dental, vision, and multiple other services for all. In this annual project, I coordinate and manage the work of nearly two hundred volunteer medical staff, interpreters, technicians, and logistics personnel. For this project, I arrange for partnerships with numerous agencies and community organizations. Most recently, I created and led the Molina Hope Diaper Drive, collecting over 26,000 diapers for children and seniors. Throughout my professional career, I have managed teams ranging from 15 to 40 individuals. This has included Patient Access Coordinators, Health Enrollers, Outreach Workers, and Support Staff. Most recently I managed our Community Engagement teams in 10+ states across the nation, ensuring that we focused on the mission to serve and partner with agencies who focused on Caregiver Support, Homelessness, Food, Healthy Living, and Literacy. Today, I manage a team of 10 Community Engagement Specialists that focus on those community needs, bridging services and accessibility to healthcare. This is why this is my dream job. The position with Molina Healthcare has allowed me to focus on the needs of my community and super serve them. I derive tremendous pleasure and satisfaction from helping people in need, from leading people who share the same passion to meet community needs, and in affecting the lives of volunteers, fellow employees, and service recipients. I have been recognized by several elected officials and the Consul of Mexico. It humbles me to think that what brings me so much joy might make me worthy of such recognition and of a nomination for the Latinas of Influence Award. The Latinas of Influence Selection Committee has a difficult task before it. Undoubtedly, you will have to choose from a multitude of deserving individuals, each of whom has touched many lives. I don’t envy you, yet I know you will leave this experience better for it, for you are bound to become acquainted with many powerful women. I write to add to your task by nominating one of those powerful women. I also write to ease your task, however, for I nominate a candidate whose influence on the lives of others is unequalled, a woman who daily serves as an example of the best within us all and who brings out maximum effort, competence, and enthusiasm in those who serve with her. Her name is Ruthy Argumedo. I have worked with Ruthy and her staff for 7 years as a volunteer and partner in Molina Healthcare’s community projects. During that time, I have seen numerous instances of the effect Ruthy has on the lives of many. Obviously, the hundreds of uninsured and underinsured who receive medical, dental, and vision care at the annual Care 4 a Healthy IE clinics walk away grateful for the alleviation of their health issues. Equally important, they walk away with evidence that there are people who care about them and who will guide them to follow-up care. Volunteers are also greatly affected by their work with Ruthy, for they quickly learn that their work is valued and their time is used efficiently. This leads them to want to continue serving the community. Net result is that we all benefit from the motivation to serve that Ruthy encourages. Ruth’s impact on clinic clients and volunteers is life changing and long lasting and a credit to her management skills in bringing the health clinics to fruition. Ruthy’s public relations skills have created a number of exemplary partnerships between Molina Healthcare, community organizations, and public agencies. The effect of those partnerships greatly enhances the strength and breadth of the work of those individual entities. Since I began working with Ruthy, I have seen the number of groups desirous of joining the Molina Healthcare community service efforts increase every year. I believe this to be another excellent example of Ruthy’s influence. I know that Ruthy has received numerous awards, some recognize her leadership skills, others the community-wide impact of the numerous projects she has created and implemented. Ruthy is a genuinely modest person who readily credits her staff and volunteers with each award bestowed upon her. What she does not acknowledge is the impact she has on her staff. They have praised her to me often, telling me how they value her as a role model who has given them opportunities to stretch their competence level and raise the vision for their own future. I nominate Ruthy Argumedo with gratitude and admiration for her impact on individual lives and our community as a whole. I sincerely thank Hispanic Lifestyle for giving me the opportunity to nominate her for an award that demonstrates to all that we have women of high caliber and influence in our Hispanic community. Finally, I thank the selection committee for the role they will play in this very worthy endeavor.